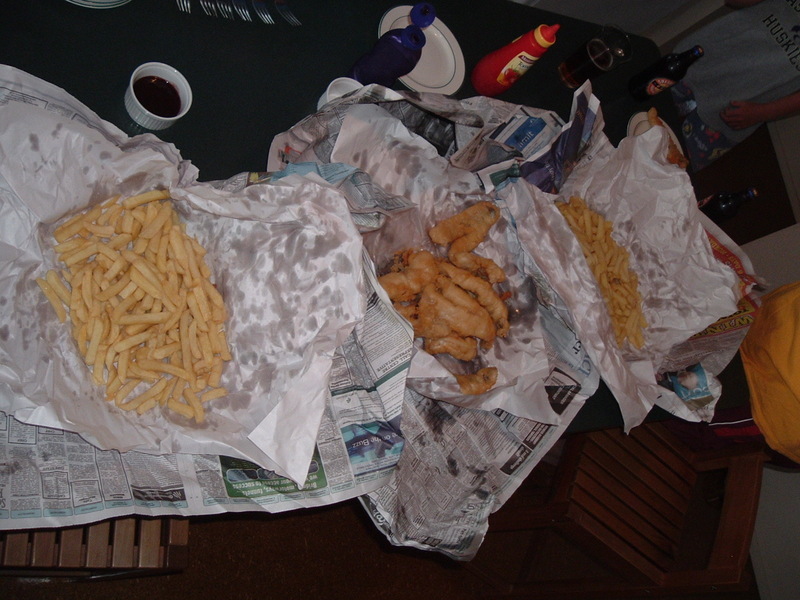 For cheap comfort food, fish and chips is fitting. 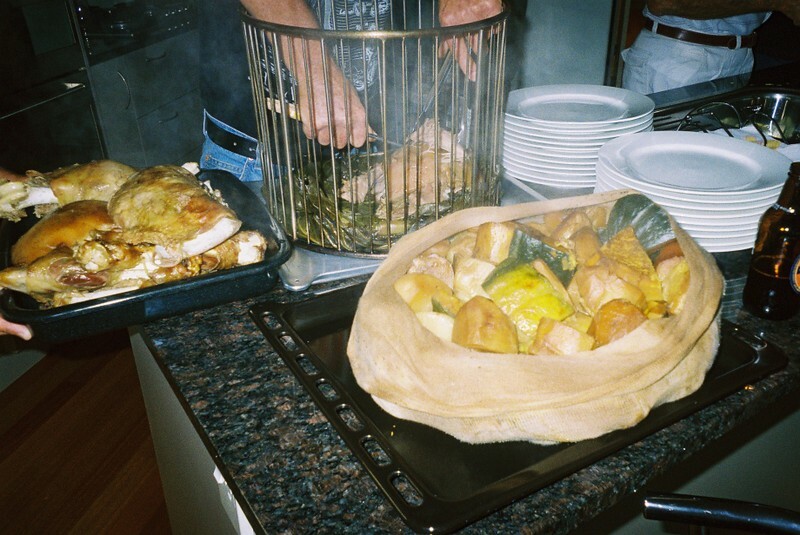 We enjoyed this meal with Speight's beers a few times on our New Zealand trip. We usually got it as a take away item, meaning "to go" and to be eaten at home. It's hot, filling, and satisfying. John Dory seems to be my favorite fish for fish and chips, but their are competing views on which local fish makes is best. I love all that starch and grease, tampered by vinegary sides of ketchup and home made plum sauce. There's never any leftovers, and almost forty dollars feeds four adults with healthy appetites and two kids. My cousin Gabrielle worked at the same take away spot that her Dad did, forty years ago. I like hearing about that sort of history for their small town. Their roles were different: she usually rang folks up and scooped ice cream; he filleted and cooked fish and chips. Headed to Work? Sushi Time. Occasionally when I have catering jobs, I like to treat myself. Even though I work around food, I obsess over it on off hours. Sushi is a top pick for a pre-work meal. It's satisfying, healthy, and filling. Without the uncomfortable bloat some other foods may give, burgers and burritos being the top offenders. Better to eat before catering, because it's unsure if and when you'll get another bite. Or what the food will be. My least favorite staff meal: Subway wimpy sandwiches, hands down. Generally, staff meal is not a showcase for any chef's talents. More like: empty the walk in fridge and make the most puzzling array of dishes (hot dogs, limp salad, etc.). So maybe it's not best to use a pre-work meal as a reward, but that's pretty much what I do on the days where I'm dragging. I move a little quicker when a restaurant outing looms in the near future. No fake smile needed while I head to eat and work! Isobune tends to be a breeze. I never wait for a seat, and can select and eat dishes from their rotating circle of sushi boat plates. If I'm especially hungry, I start with miso soup and seaweed salad. In the drink department, they do a good job on keeping the green tea cup full. Warmth and caffeine, all better now. Especially when mixed with bites of fresh fish, and wasabi rich soy sauce. After paying the $20+/- Isobune bill, I take in the sites of the Japan Center. Read reviews and menus, people watch. Maybe even stroll up Fillmore and see what is on the menu at other places. For a sweet treat, hit up Bittersweet. Or use my Peet's card for yes, more caffeine. Candy Blog liked this post and included it in a round up on the show. I'm showing off some Fancy Food Show loot. Working as a booth babe has its bennies! The last day of the show always fills me with anticipation and strong desire. This past Tuesday, I had a list of items I wanted to scavenge. Competition was tight with my co-workers at the booth. I noticed the two first days of the show, they'd mutter and eye the cold case of items, and debate which ones they hoped to take. For starters, I am a lot more sneaky at getting what I want. But, I also had a competitive edge. 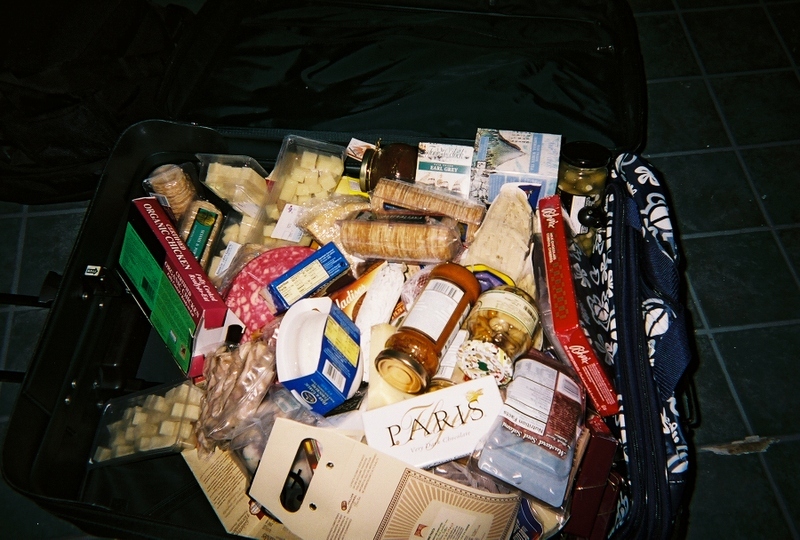 I brought a gigantic suitcase (Rule Number Four: make sure your bags have tons of pockets! ), back pack (see Rule Number Four), and one other bag. While my co-workers said stuff like "You're so funny!" as they noticed me dropping bottles and packages into my suitcase, I wanted to tell them I'm more like deadly serious. But that might've been too dramatic and scary so I smiled and kept moving. I planned on stuffing my suitcase with as much food as possible, and had been smiling and flirting at other booths so as to raid their loot. I didn't come home with a whole prosciutto or Serrano ham leg, which I really was hoping for. I asked and asked at various Italian and Euro themed booths, but most whole legs were being given back to the distributor locally, or shipped home. Sad! And no, I didn't want to buy one, that is so(!) beside the point of Ms.-Don't-Mind-If-I-Do living. I put so much pressure on myself to get the prosciutto leg or other giant piece of cheese, I was ready to barf mid-afternoon. My breathing was faster than normal, and walking the show floor only made it speed up even more. The dreamy thoughts I had at this point kept jumping all over the place: chocolate! Cheese! Honey! Olive Oil! Cookies! Tea! Coffee (dare I ask for whole beans for free? Nahhhh.) The overall take of most of the items just listed, with a healthy dose of cured meats, pasta, Javan spices, blood sausage, pate, and chicken, pleased Oscar and filled our cupboards and fridge. Now that the show is over, I can move on to another mental game: how many meals can I eat off one show? The other fun side game is finding out exactly how much the items cost. Last night at Bristol Farms (just looking, you picketers! ), half of one of our cheese wheels was priced at a whopping $64. Yeesh. It may make some queasy to see animals knowing they will eventually be killed for the sole purpose of eating. If that's you, stop reading now. 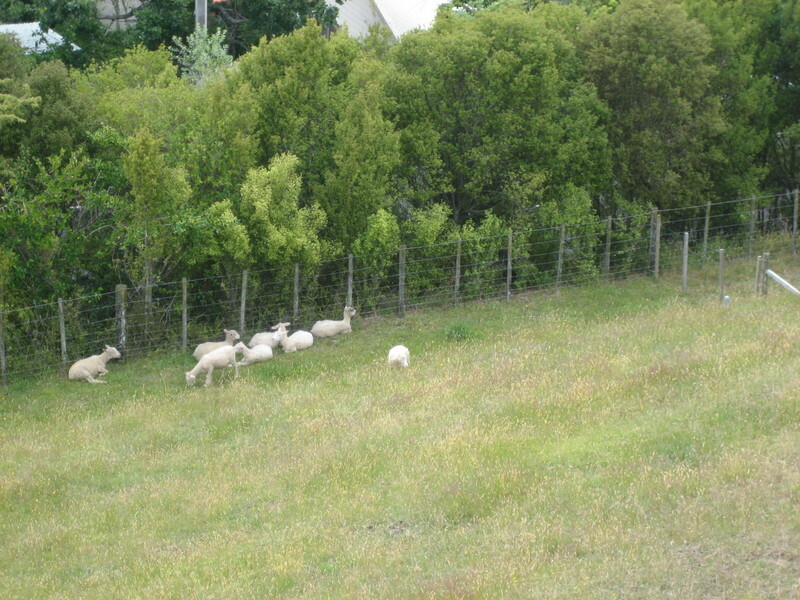 Staying with relatives in Whitianga, New Zealand gave me the opportunity to watch and observe their sheep herd. They have almost a dozen lambs that are rotated every few days, from one paddock to the next. The timing is decided on how much greenery they have consumed on each square of the plot. While they are alive, the lamb's purpose is to eat and subsequently fertilize the land. There is only one lamb named Lucy that will be spared from ending up as dinner. She is much larger and decidedly more vocal and outgoing than the others, as if she knows it's her turf. Talk about eating local. 50 miles? How 'bout 50 steps or less? We ate lamb a few times in the three weeks we were in New Zealand. My uncle Steven uses a BBQ rotisserie to cook the leg. I asked how he does the killing. He shoots the animal in the head first, and butchers it immediately after. 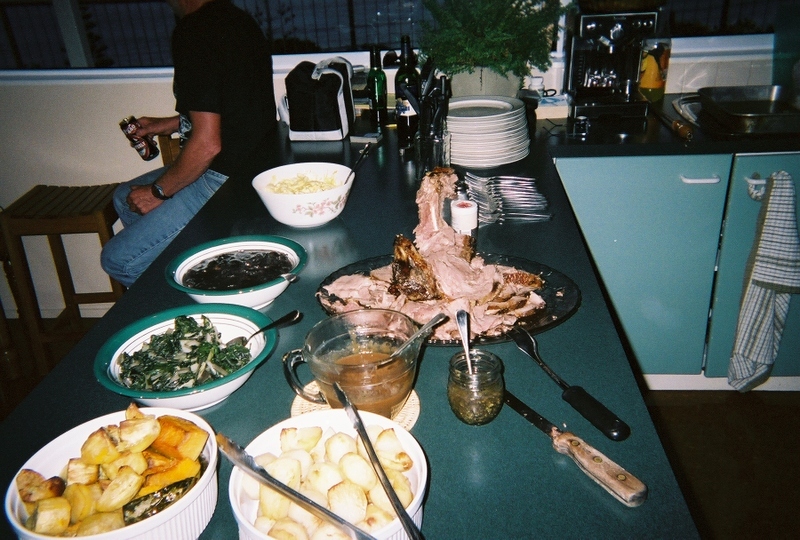 Enjoying lamb is a common "truly Kiwi" meal. The meat was tender, juicy, and not at all gamey. Served with mint sauce, salad, kumera and pumpkin, foraged mushrooms (by the family's 78 year old grand-Mum), potatoes, and other garden items. Definitely filling and tasty fare. One interesting note: Oscar was first asked to carve the lamb, but the duty went to me after Oscar admitted that was my "area of expertise." Touche. One of my favorite events each year is the Fancy Food Show at the Moscone Center. It is a huge show, with thousands of products and people. It can be daunting to try and see and do everything related to this show, and talking and eating fatty foods all day long zaps my energy. For sampling, I like trying new things, but also gravitate towards old favorites liked cured meats, cheese, and chocolate. Although I work in a booth, there is enough time for me to patrol the floor and take in everything. Rule Number One of working the Fancy Food Show: bring business cards and wear comfy shoes! There is ample chance to network, but you won't likely be sitting much if at all. Rule Number Two: Dress to impress, with a little flair. This tradeshow is different from other business events. The attendees are generally happy. My guess would be they love being around food and seeing old colleagues. Women and men both wear more colorful and creative looking things, but there are a fair share of suits. European men stand out for their suits with brown shoes; it is rare to see them in black shoes, I've noticed. Also, several of the Euro women look stunning, with wide leather belts, accessories, and form fitting clothes. Bottle their secret, or tell me what it is, so I can get some of that! I tried to mimic them by wearing scarves and slightly darker lip goo than usual. Teas that flower and bloom seem to have a growing presence this year. Ditto for nuts and brittle. There are so many salsas, prepared pasta sauces, ethnic food kits (the kind that have sauce and noodles, just add meat and or veggies) and dressings, continuing in popularity. Chocolates, sweet biscuits, crackers, dessert sauces, and other sweets also dominate. Rule Number Three: start with no breakfast or if you must, eat a bowl of fruit, since that is likely the only "healthy" eating you may do during the show hours. Did I mention there is lots of wine, port, and beer to "sample"? In years past I have imbibed (ah, now maybe that's why everyone is all smiley? ), but was too tired this year. The show can be extremely social. I saw: Sam from Becks and Posh, Amanda Berne, Chef Dorothy Whittenburg, Marc Vogel, Joseph Schmidt, Bruce Hill, Brian Kenney, Martin Yan, and Tony Tantillo. I decided not to run after Tony when I saw him. I wanted to thank him for always being so kind to me when I was an intern at CBS years ago. He'd give me any leftover produce after the taping of his segments, and was friendly and helpful wit food related information. Perhaps the thanks would've made him happy, but I felt awkward about doing it. How nice it must be to have a net and boat, and be able to catch and eat accordingly. Every day. 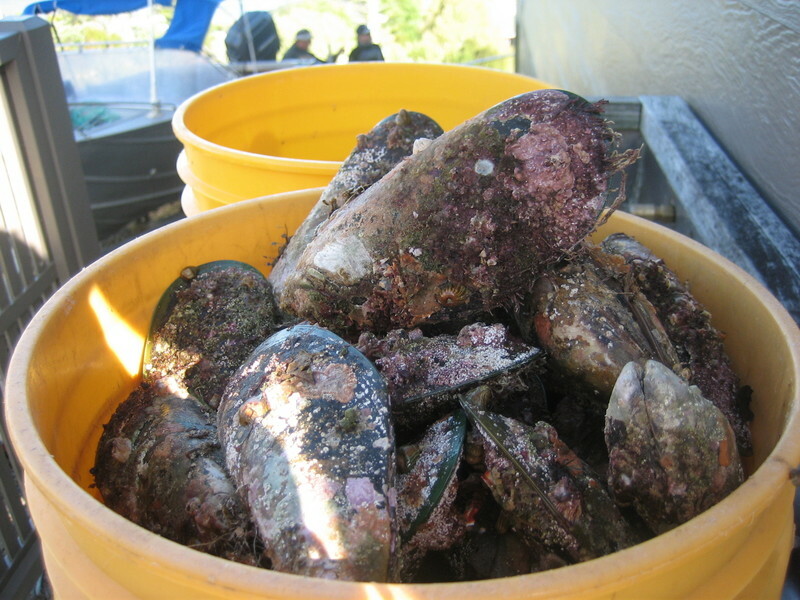 During our stay with relatives in New Zealand, we were amazed to share the bounty of fresh, untarnished seafood. My Uncle Steven uses his boat out to check his net. The tractor-rigged boat ride to the beach takes three minutes from their house. There are a line of tractors since no ramps are used to get boats in the water. This tractor approach is used throughout the country, and I wish I had thought to take pictures. On one net checking trip, we found a "small" sting ray that he called an Irwin killer. He cut the stingray off and the bottom of the creature looked like a ghost as it slowly opened and closed its mouth. Another Irwin killer had already been de-rayed on a different day. Steven had caught one that had a span of over five feet. It weighed down the net considerably, and made it tough to pull up. 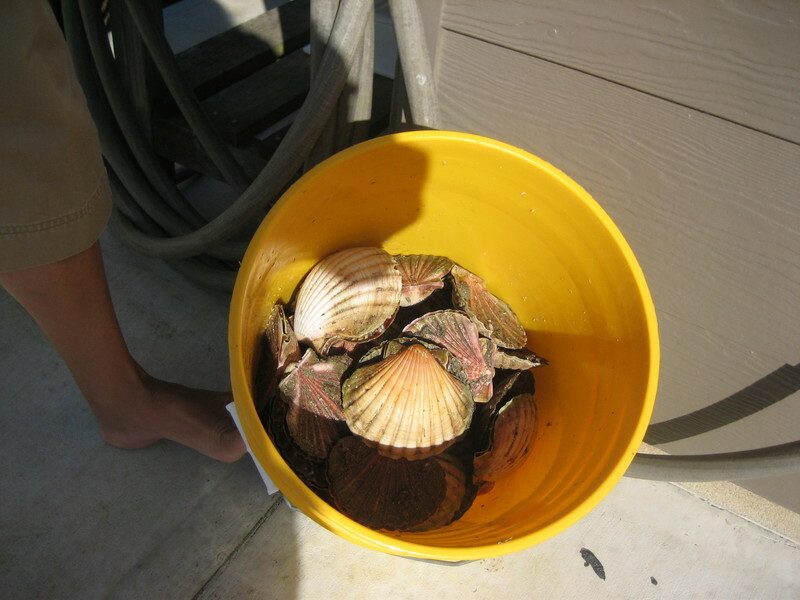 One of my favorite catches are scallops, which must be big enough to warrant taking. Steven's boat is rigged with a ruler and diagram detailing mandatory size limits from the New Zealand government. The sign reads, "Size does matter," which seems like an interesting term to see on a government sanctioned guide. Eating the scallops with the roe sack attached yielded luxurious, buttery taste and a silky mouthfeel. Because the roe sack has a stronger, richer flavor and is highly fatty, it was recommended that we remove it after a few samples. Trying the scallop in its raw state seemed to be pure ocean: salty and a little sweet. Love at first bite. The Edinburgh Castle has an interesting haggis event this Saturday. I love the Castle. I started drinking there when I was a student at the California Culinary Academy, because it's within stumbling distance. The Tenderloin location (complete with the occasional pot smell near the door) has an old feel to it. There's lots of wood, dim lights, and an ample adult beverage selection. We have most of our Litquake meetings there, and Alan Black makes sure there is a year round roster of book, music, and other cultural happenings. I haven't yet tried haggis. But this might be the perfect chance. No, not Scottish cannonballs but Scotland's national dish, The Haggis. Ingredients are a State Secret in Scotland but leaks suggest that a sheep's stomach filled with magic potions is oozing deliciously from the sides. Now's your chance to fight for a small piece of haggis. IT'S THE CASTLE'S BIGGEST PARTY OF THE YEAR. I have several New Zealand updates that will be up asap. Sure, it's sad to end a vacation, but I have a thrilling three day event to kick things off. Soon, I will be taking home many goodies from the Winter Fancy Food show. It takes place at the Moscone Center, starting this weekend. This is my third year at the show, and the last day of the show is always a thrill. Not only will I be able to see and sample what's new in the marketplace, I can fill my bag(s) and head home. Let the feastin' begin! Thank you for accepting the demo positin for the Winter Fancy Food Show at the Moscone Center in San Francisco. Show hours are 10:00 am - 5:00 pm on Sunday, January 21 and Monday January 22 and 10:00 am - 4 pm on Tuesday, January 23. Please arrive at least 1/2 hour prior to the opening of the show. Our booth is #REDACTED in the REDACTED hall. Your badge to gain admittance to the show will be available at the Exhibitor Badge Pick-up Desk. You will need a photo ID (the badge is under your name c/o REDACTED). There might be a long line the first day of the show so please plan on getting to the convention center around 9:00 AM. With the exhibitor badge, you can gain access to the show floor prior to 10:00 am. Please wear a white top, black pants and comfortable shoes. We will provide an apron and all supplies for the demo. You will be responsible for the set up of your demo station, sampling and clean up at the end of the day. The rate of $REDACTED per hour will be issued in the form of a check approximately three weeks after the close of the show. If you have any questions, feel free to contact me at REDACTED. I can be reached at the REDACTED hotel once I arrive in San Francisco, on my cell phone at REDACTED.